Product prices and availability are accurate as of 2019-04-22 11:53:58 UTC and are subject to change. Any price and availability information displayed on http://www.amazon.co.uk/ at the time of purchase will apply to the purchase of this product. The subtitle of From High Heels to High Hills is: one woman walking the Lake District in her own style. This is exactly what this very engaging book offers. The author Tanya Oliver, is determined to show that fell walking is not just for toughened walkers in North Face jackets and sturdy boots. You can like high heels, you can like the colour pink and you can still be a passionate and experienced fell walker. 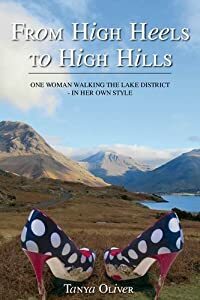 The author is often amusing about her weakness for high heels and for pink, but her greatest passion is for the Lake District. For its mountains and tarns. She was taken there as a child and was initially a reluctant walker, but gradually the sublime beauty of the landscape got under her skin. She has walked all 214 of the Wainwrights. She describes her walks with a lot of humour and self-deprecation, but she is not afraid to become poetic about just how wonderful a good climb and a glorious view makes her feel. I like the way her personality comes through so strongly. The book is full of great photos too. She writes in the introduction: "I am an ordinary walker and have no wish to be anything else. I simply love climbing mountains and I want to encourage others to do the same." I think this book will definitely encourage others to start walking the Lake District.